The Atlanta Fed third quarter GDPNow Forecast inched up today, primarily based on August motor vehicle sales. 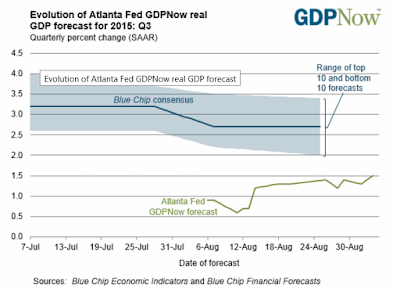 The GDPNow model forecast for real GDP growth (seasonally adjusted annual rate) in the third quarter of 2015 is 1.5 percent on September 3, up from 1.3 percent on September 1. The nowcast for third-quarter real personal consumption expenditures growth ticked up from 2.6 percent to 2.7 percent following yesterday afternoon's release on August motor vehicle sales from the U.S. Bureau of Economic Analysis. Wondering why the Blue Chip forecast always seems to lag the GDPNow forecast, and by varying amounts? The Blue Chip forecasts are always published on the 1st and 10th of the month. Furthermore, on the graph, we use the “survey” dates, which are about 4-6 days before these publication dates. This implies the Blue Chip forecasts will, at a minimum, lag about 5 days behind GDPNow and can lag as much as 25 days near the end of each month.